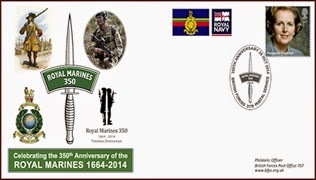 This year The Royal Marines celebrate their 350 Anniversary. Formed in the reign of King Charles II on 28 October 1664 as the Duke of York and Albany’s Maritime Regiment of Foot (or Admiral’s Regiment), the name Marines first appeared in the records in 1672. In 1802 they were granted the title Royal Marines by King George III. special stamp issue, which will be released on 14 October 2014. This will be cancelled using a unique BFPS numbered handstamp depicting the official ‘Commando Dagger 350’ logo. The cover comes complete with an A4 double-sided insert in full colour telling the story of the Royal Marines. The cover and insert are presented in a cellophane sleeve to create a high quality souvenir of a truly historic event.